A man lost in voices is hanging up white sheets: A schizophrenic attic-tale about the unconscious fight for balance. Sebastian Winkels was born in 1968 and worked as a camera assistant before entering the "Konrad Wolf" Academy of Film & Television (HFF/B) in Potsdam-Babelsberg in 1996. 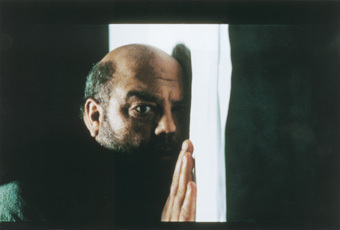 His film The Upper Storey (Oberstube, 2000) was presented in the short film competition at Venice in the same year. His other films include: Volles Rohr (documentary short, 1997), Hase & Igel (documentary short, 2000), partie lento (short, 2001), Innen-Aussen-Mongolei (documentary short, 2002), and 7 Brothers (7 Brueder, documentary, 2003).